The International Congress of behavioral medicine. We were granted money from EPINOR to partake at the 13th International Congress of behavioral medicine. The conference was held in Groningen (or, as the locals say; ckhckkhckhkhhråningen), the Netherlands. Makalani: I submitted two abstracts to the conference. One was about neck pain in adolescence and was accepted as a poster presentation, the other was on causal beliefs in breast cancer and was accepted as an oral presentation. My poster session took place on the first night, parallel with the opening ceremony. Everyone were happy to be there, happy to see each other, and much more talkative than I usually have experienced at poster sessions. I got to talk to a lot of scientists from around the world, and had a great time. At the opening ceremony I was awarded an “early carrier award” for my poster – a great joy and inspiration for further work! On the last day of the conference I held my oral presentation. Though it always makes me nervous to talk at conferences, in front of all these people that know so much, it was a good experience. I guess you learn just from doing it, and also it is fun when people come and want to talk to you about your research after. Kristin and I also attended a meeting for young researchers organized by the network INSPIRE. More experienced researchers from around the world shared experiences, thoughts and strategies. It was indeed most inspiring and might very well come in handy in the next few years! The program at the conference in general was very interesting, with excellent key notes and master lectures. On top of the scientific program, the congress offered great opportunities for networking. Last fall I spent on a research stay in New Zealand. My colleges and friends located there also came to this conference, and it was just wonderful to meet up again. Also, meeting new people during coffee breaks, receptions and dinner was great. I have learned a lot and feel I return very inspired and ready to work. Kristin: I submitted an abstract to the conference titled: Adolescent school absenteeism and service use in a population-based study. It was accepted as an oral presentation which I held on the second day of the conference. This was my first presentation at an international conference, so I was naturally both quite nervous and excited. The presentation went well and I was pleasantly surprised at the interest the topic received and the questions I was asked afterwards. It was a good feeling to be able to answer the questions, especially when my supervisor commented that I seemed to be ready for my dissertation already. It was mostly a joke, but still nice to hear. The scientific program of the conference was good, with interesting topics and skilled presenters. Some of the presentations also sparked useful discussions of my PhD-work and gave me new ideas I will be working on this fall. Travelling to a conference with colleagues gave us plenty of time for discussions which we would not necessarily have had during our meetings in Bergen. At the INSPIRE meeting we received advice of what’s important to be successful as a researcher, and I would like to share some of the main points. Perhaps the most important is to be good at the core abilities, such as methods and scientific writing. Further, we were encouraged to work hard and to generally say yes to opportunities we are given. 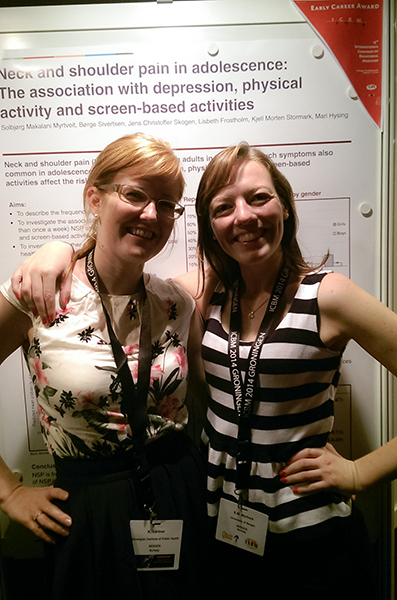 Last, but not least, we were told to have fun with our research and mainly choose to work with people we like. I will try to remember this in my future work. As Makalani mentioned, the conference was a great place to meet people and make new contacts. I am planning for a stay abroad during my PhD period and am currently trying to decide where to go and who to collaborate with. The conference gave me new ideas of who we can contact and gave me an opportunity to meet potential collaborators informally, which is a great advantage. In addition to all of the above, we stayed at a nice hotel where we slept well and were offered an excellent breakfast that made for a great start every day. And let’s be honest, that is quite important when you spend all day at a conference which can be exhausting.